Pink Rubber Glove | Flickr - Photo Sharing! As you can see the glove is stretched very tight. Here is some fluff that I have missed on this pass. My wrist hair got caught in the glove. mastervoo, ♥ shhexy corin ♥, and 49 other people added this photo to their favorites. This is by far....the MOST PERFECT photo i've EVER seen! look at the colour!composition! the thought behind it all! oh my! stunning!simply stunning!go pink gloves! simply amazing! its my windows desktop, on my t shirt, i have it tattooed on my arm. what the heck i even have a sticker of it all over my windshield! I have printed this out and given it to strangers on the street, urging them to think about the moral of this image for at least 4 hours each day. 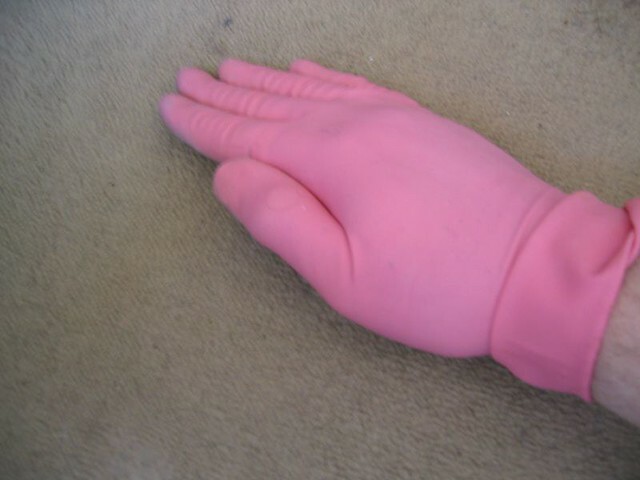 This is the most amazingly amazing photo of a pink glove I have ever seen. And you well know how tough the competition is for pink rubber glove photos. Here comes the glove again, look out Flickr!!! I so neeeeed this beautiful glove! Everyone knows Pink is my favorite color!! I just saw it in my bookmarks again! Just saw the link again in the I love you thread....still funny!! Great that it is still no 2 in explorer, we should try to get it on 1 again :). Is it too late to share my excitement that I'm finding hard to contain??! Why has it taken me soo long to stumble across this masterpiece??? The pink rubber glove lives! This is just an absolutely ingenious photo. Color, Compostition, and Detail...Why can't I take photo's like this? ...I am so envious.